This late model US Spec V62-S is powered by Twin CAT C-18 ACERT (1150 H.P.) 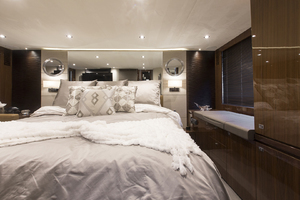 with low hours (approx. 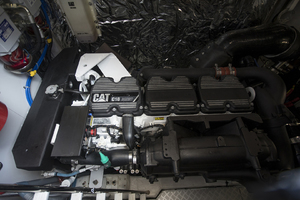 350). 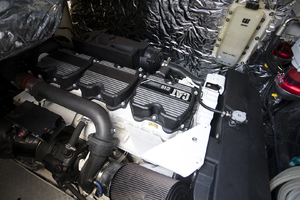 She is most likely the best optioned US Spec V62-S ever built. 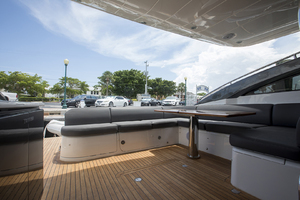 Sea Keeper Gyro stabilizer, hydraulic bow and stern thrusters, Xenta joystick control with DPS position holding, custom hull side paint (spring of 2018), custom dash layout with upgraded Garmin electronics and upgraded CAT 8" color displays, full size washer and dryer, 6 underwater lights, CAT extended warranty on main engines, full teak package, wireless Yacht Controller, true HD Sat TV, Air conditioned lazarette... The list goes on and on. This yacht is a pleasure to handle with her wireless Yacht Controller and Xenta joystick. 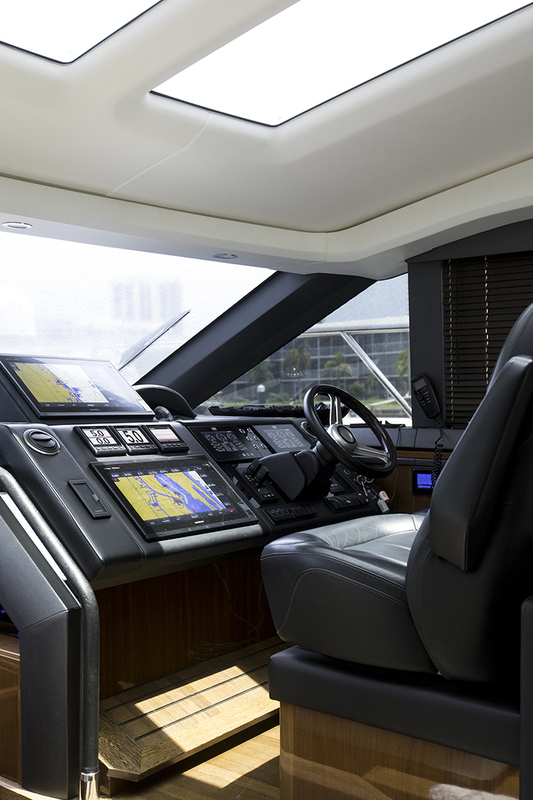 The Xenta offers joystick control for the traditional drives and her upgraded hydraulic bow and stern thrusters. 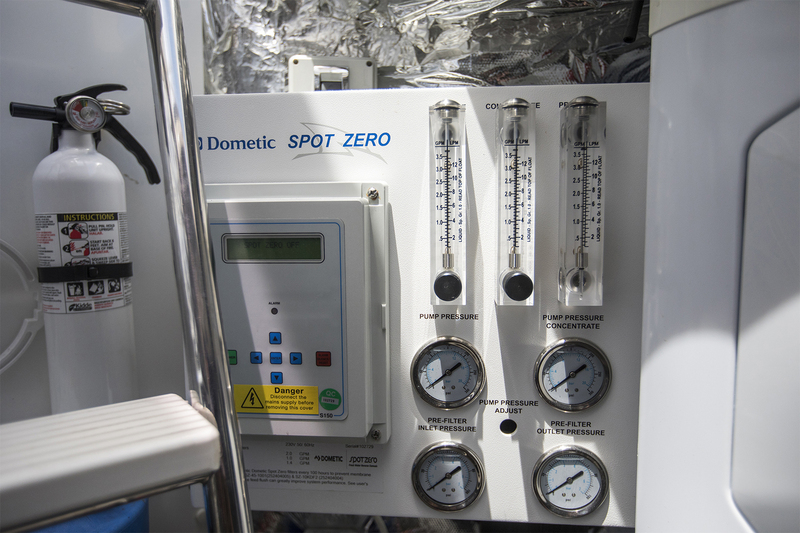 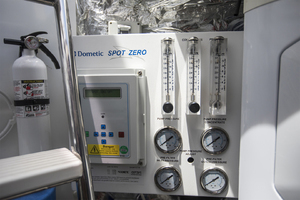 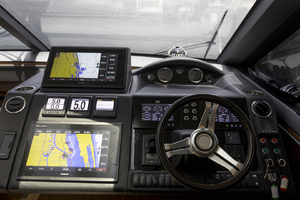 The Xenta also offers DPS position hold, when activated this feature "holds" the boat position. Eliminating the need for the captain to fight the wind or current while waiting on a bridge to open, or waiting for another boat to clear the fuel dock, etc. 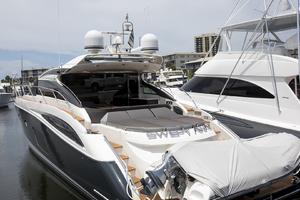 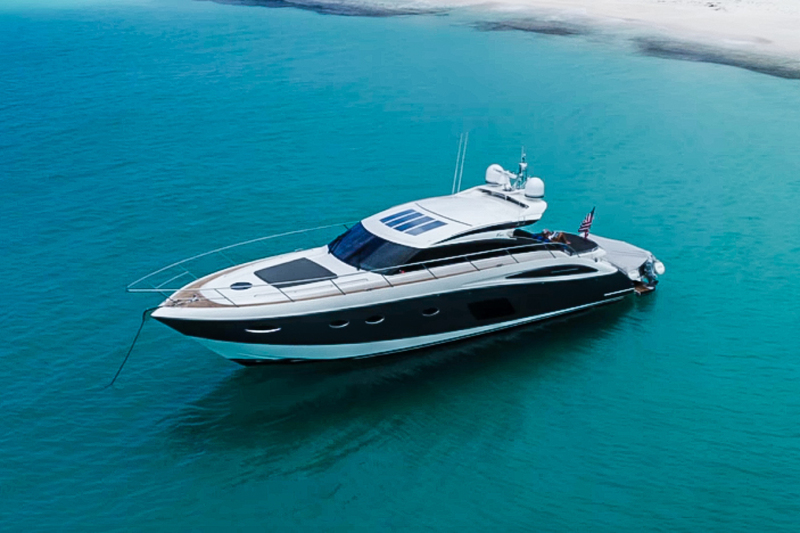 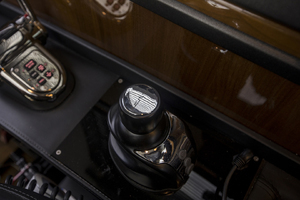 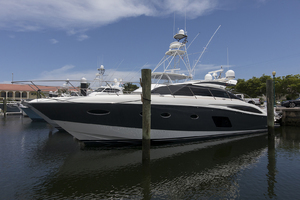 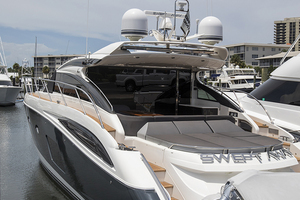 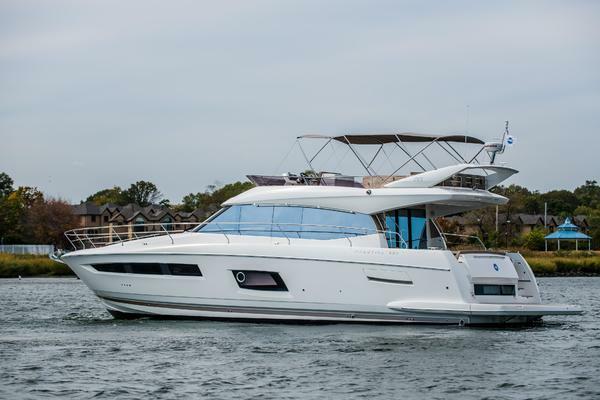 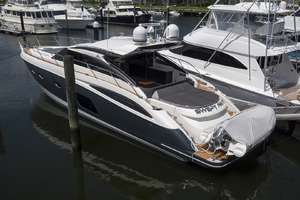 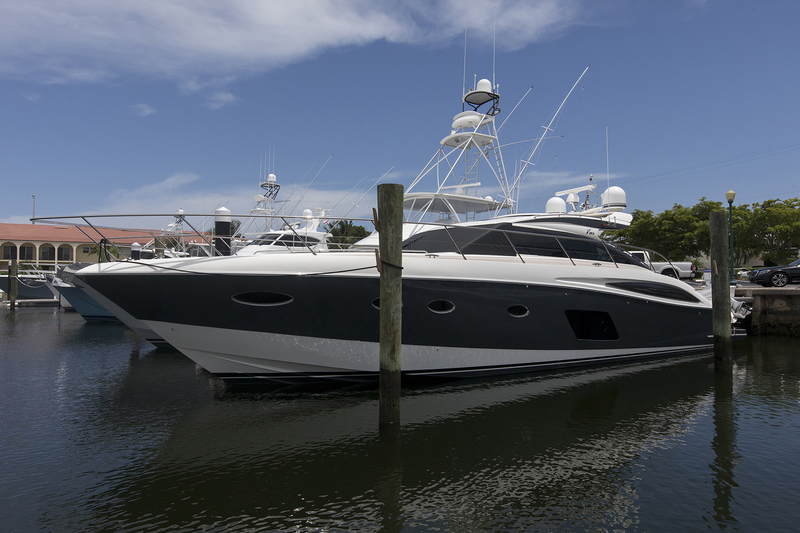 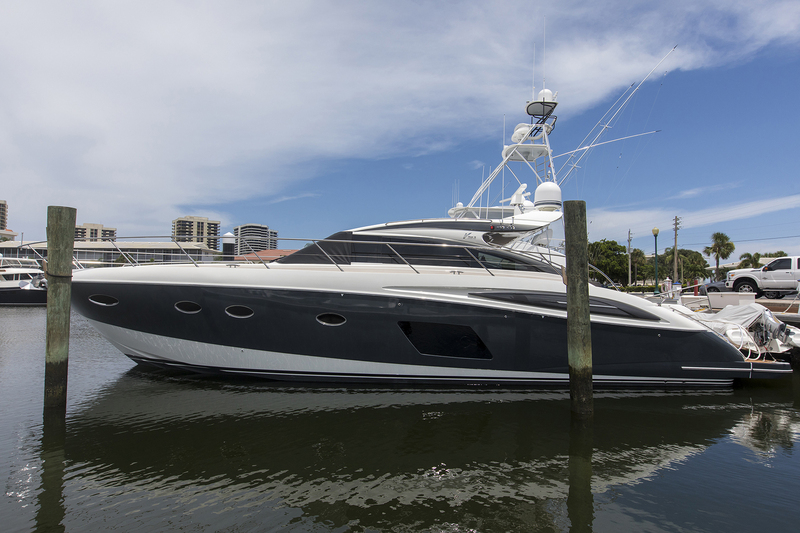 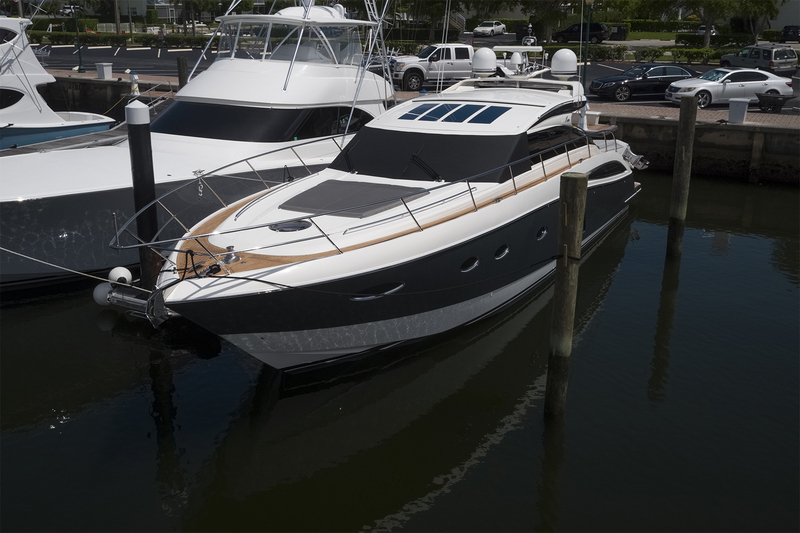 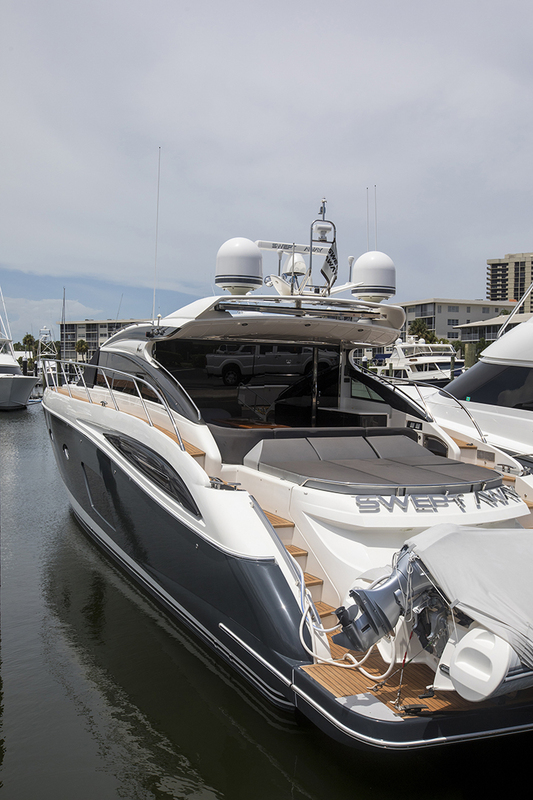 The helm is impressive and is outfitted with the touch screen Garmin electronics and upgraded 8" color CAT displays. 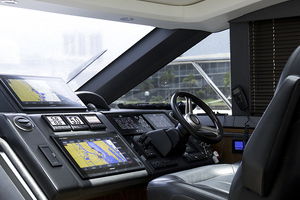 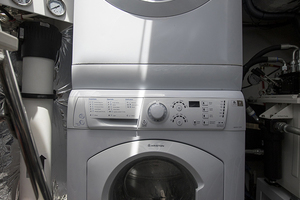 The electric opening window beside the helm offers the ability to communicate with your line handlers. 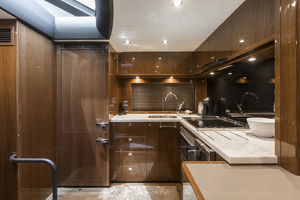 Her custom interior with high gloss walnut wood, light countertops, upgraded soft goods and interior appointments is exquisite. 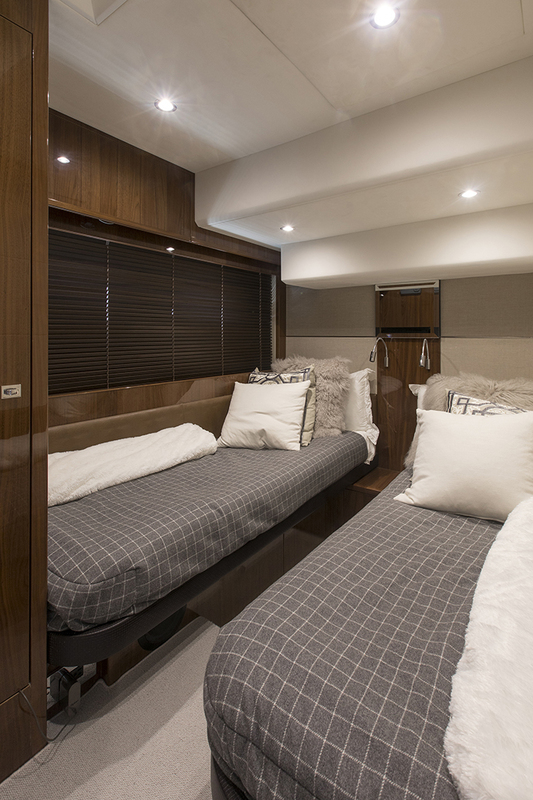 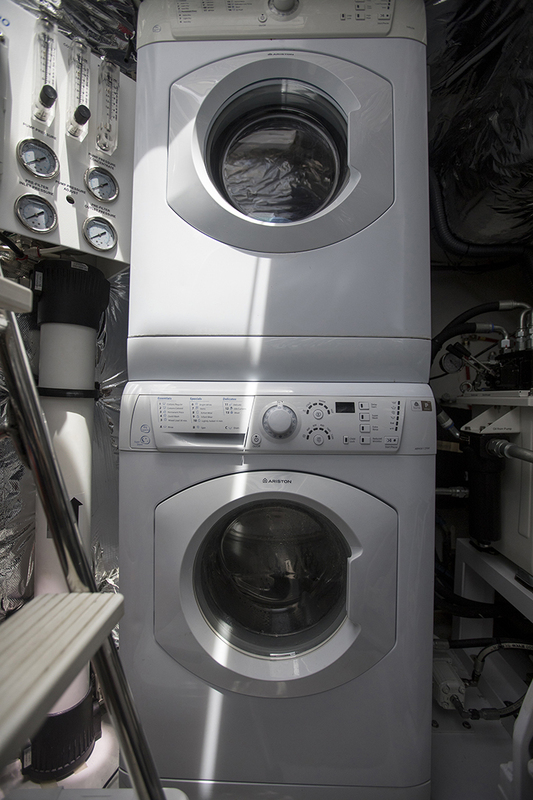 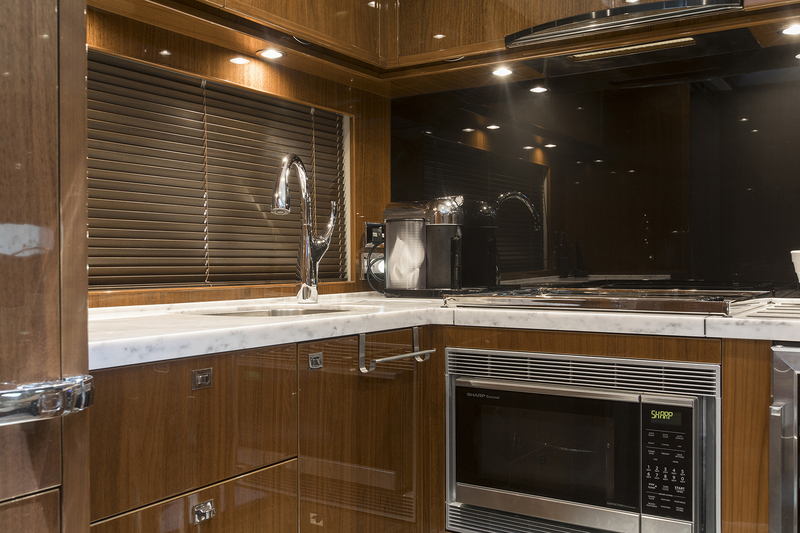 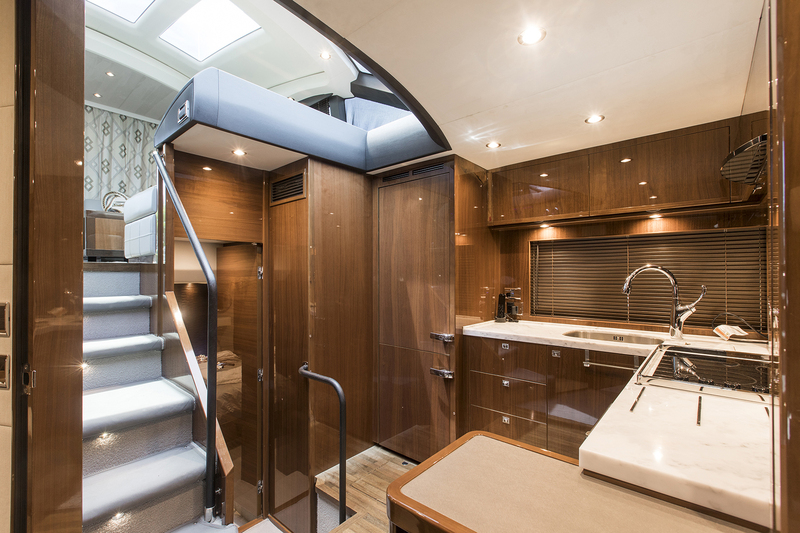 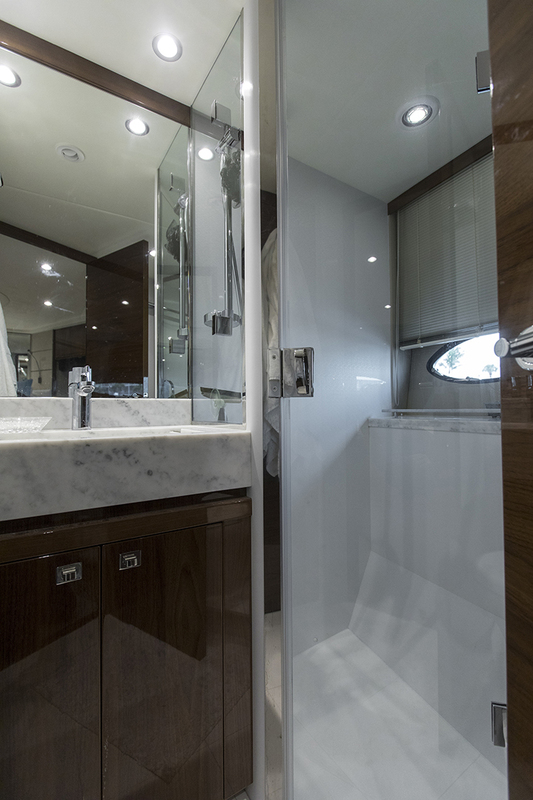 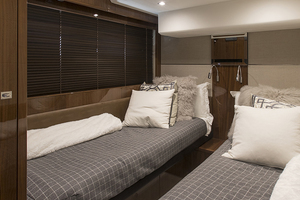 The upgrades don't stop with components, she offers extra closet space in the master, an upgraded mirror package in the heads, and custom storage space in the garage. 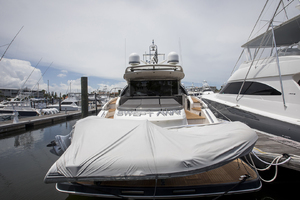 The owner approaches maintenance from a "spare no expense" perspective. 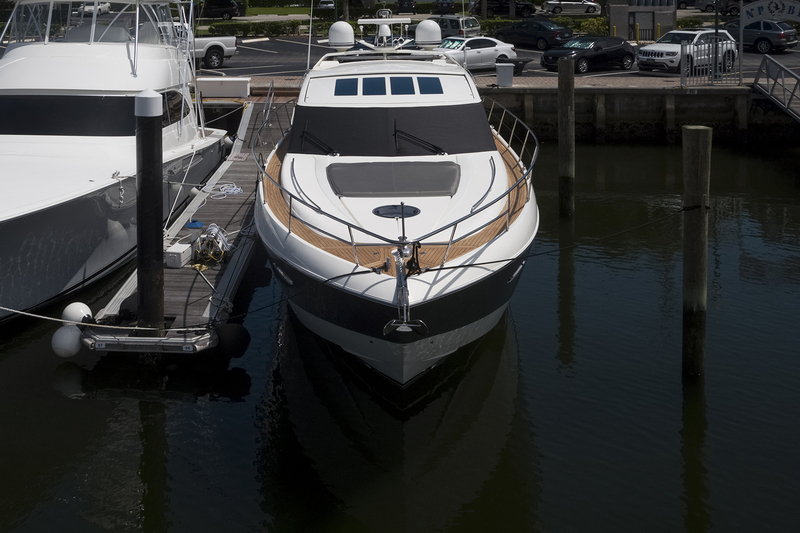 Quite simply if the boat needs or service is called for, it gets it. 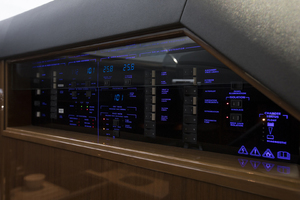 This shows in the condition, the upgrades, and maintenance logs. 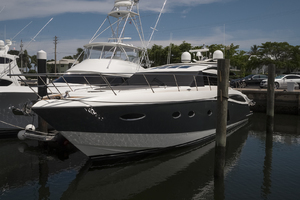 She is being offered with a 2016 14' Brig tender with 40hp Honda engine. 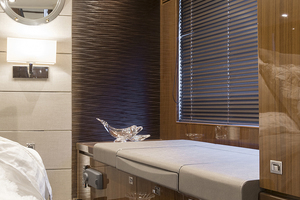 Call us to schedule an appointment with her! 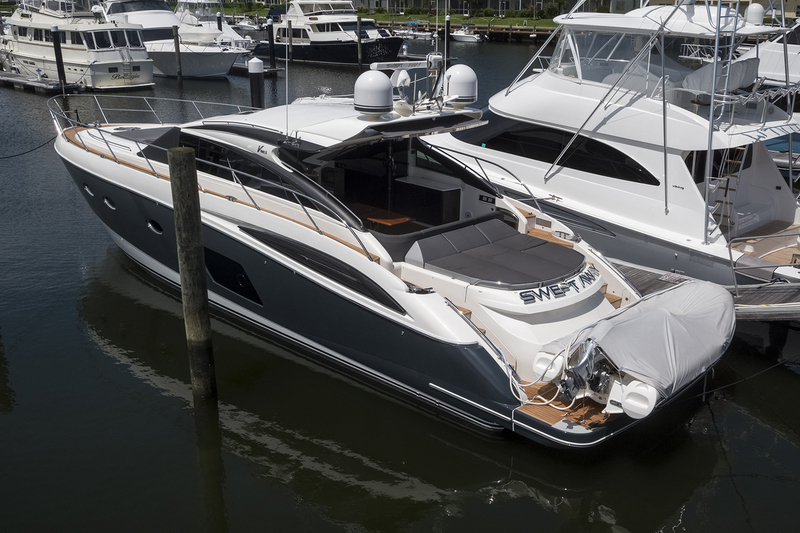 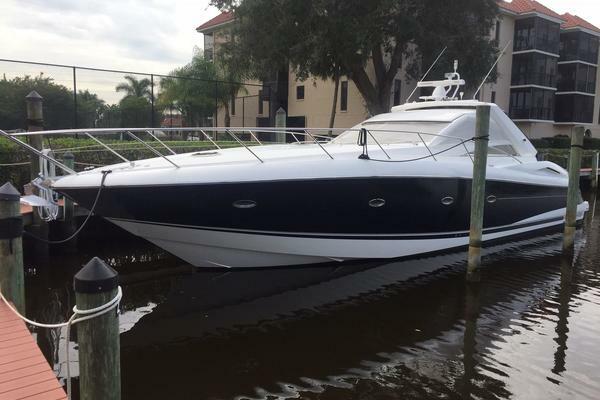 SWEPT AWAY offers an unparalleled combination of options, cleanliness, style, performance, and comfort very rarely found in a boat this size. 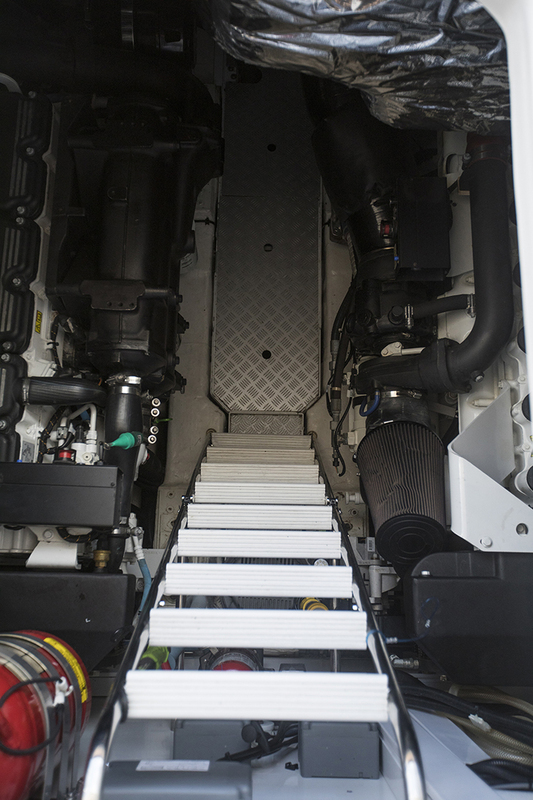 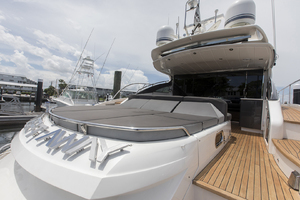 The boat is equipped with a hydraulic swim platform with folding SS swim ladder. 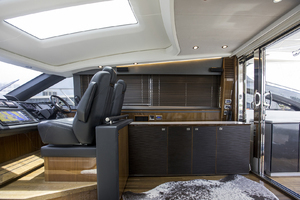 The large swim platform offers a space to store the 2016 14' Brig with 40hp Honda engine, as well as a teak beach for swimming, diving, or simply watching a sunset. 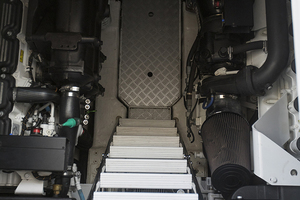 Access to the custom storage garage is from the swim platform. 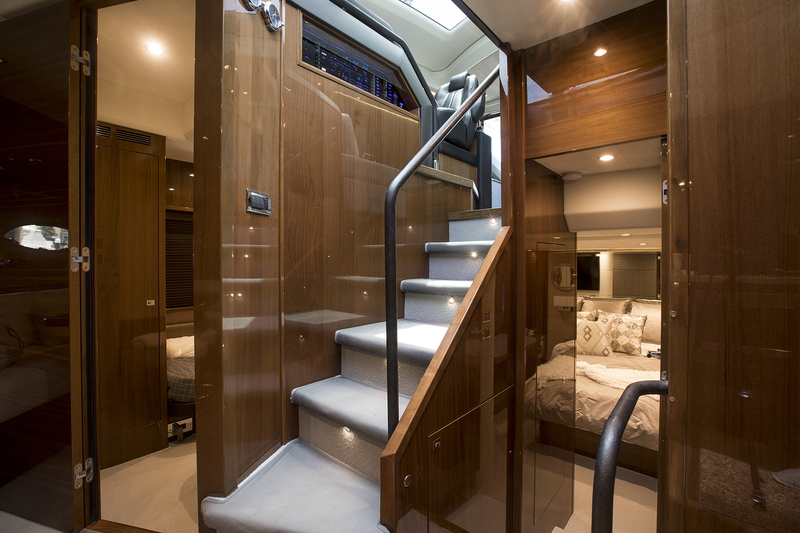 The STBD side staircase gives access to the spacious teak cockpit area. 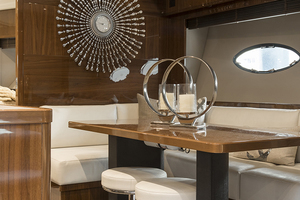 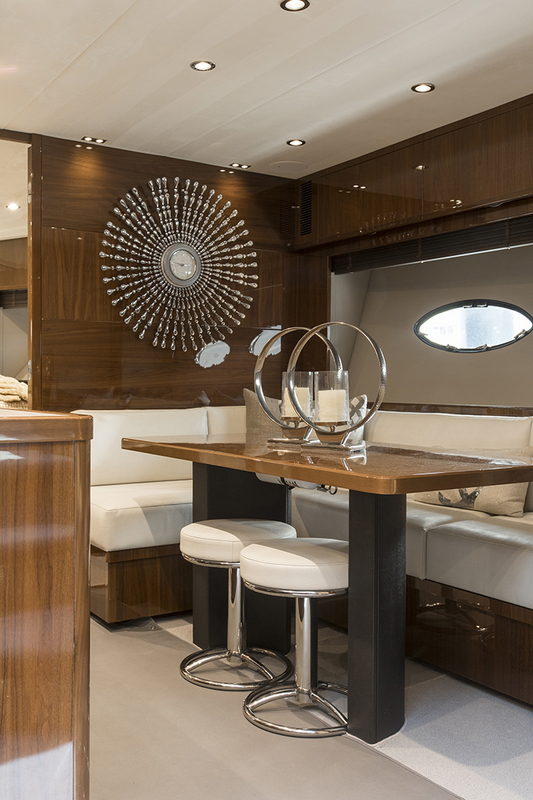 The cockpit features a very large J-shaped settee to port with a folding teak dining table and a large countertop cabinet to STBD with Waeco drink cooler and cockpit grill. 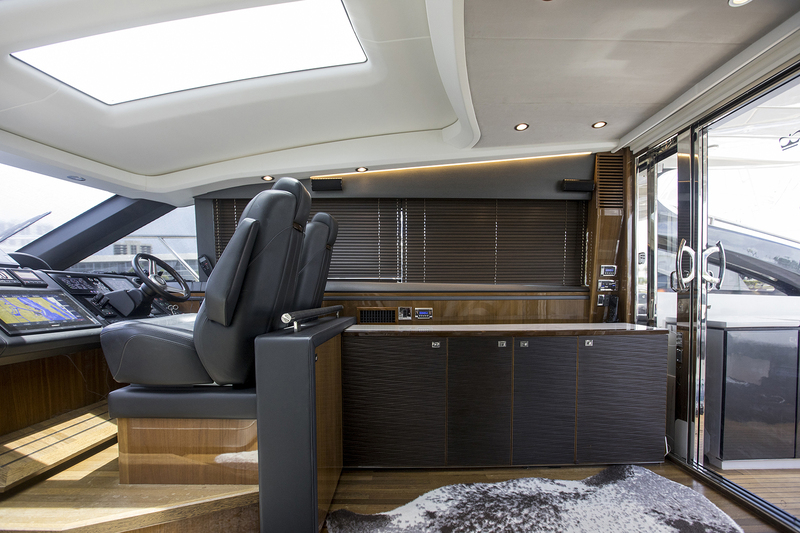 Immediately aft of the seating area is a large sun pad that extends out over the large, hydraulically actuated storage garage door. 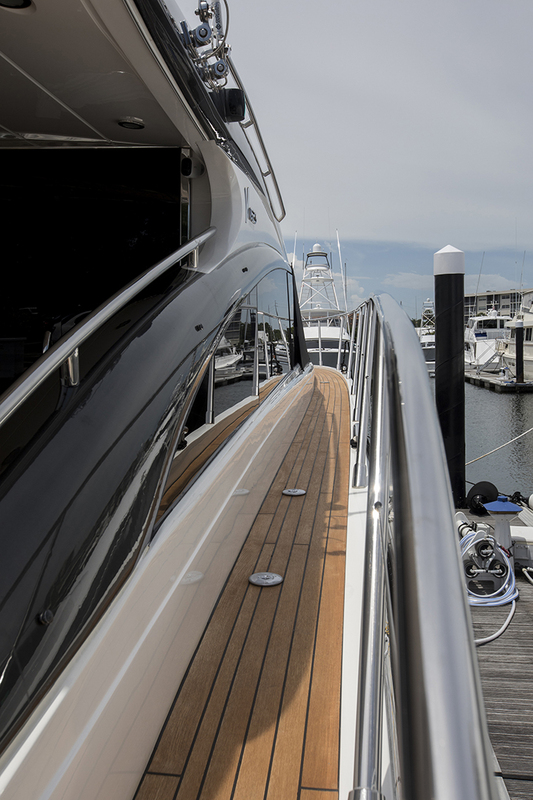 Off the swim platform to both port and STBD sides are stairs that lead up to the teak side decks allowing direct access to the foredeck. 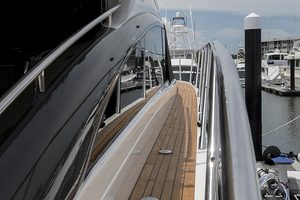 Her full teak package offers teak lined walkways all the way to the bow. 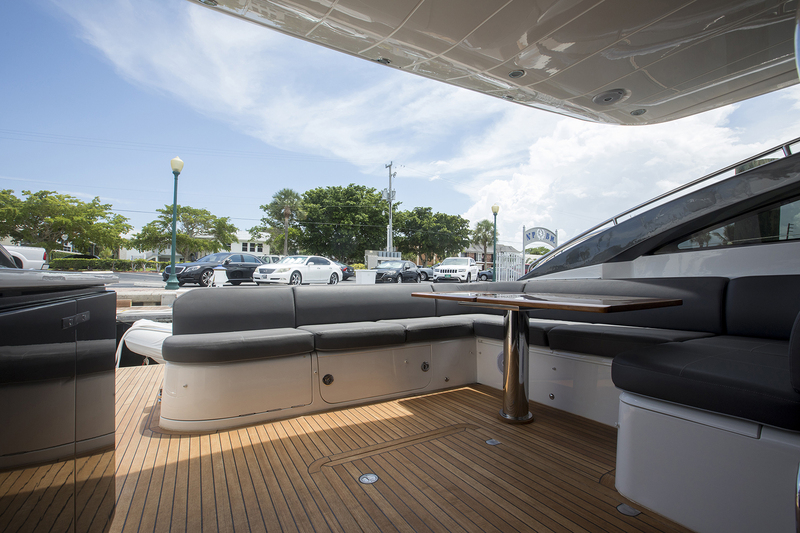 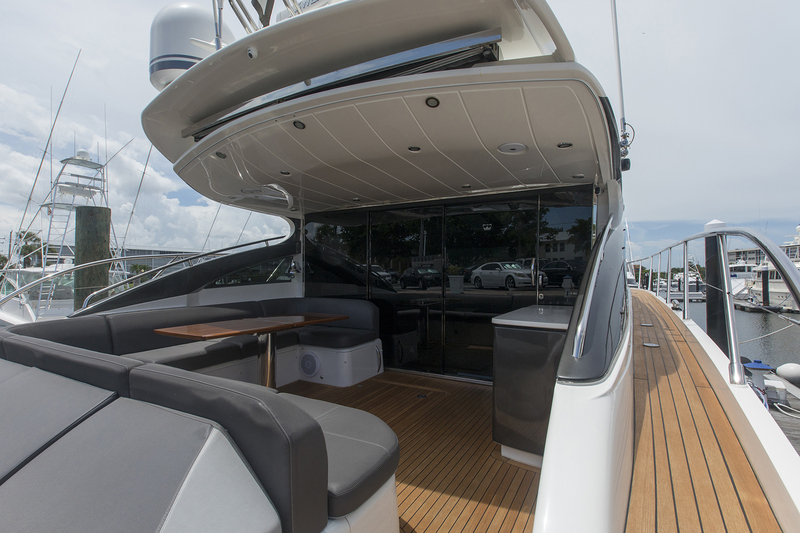 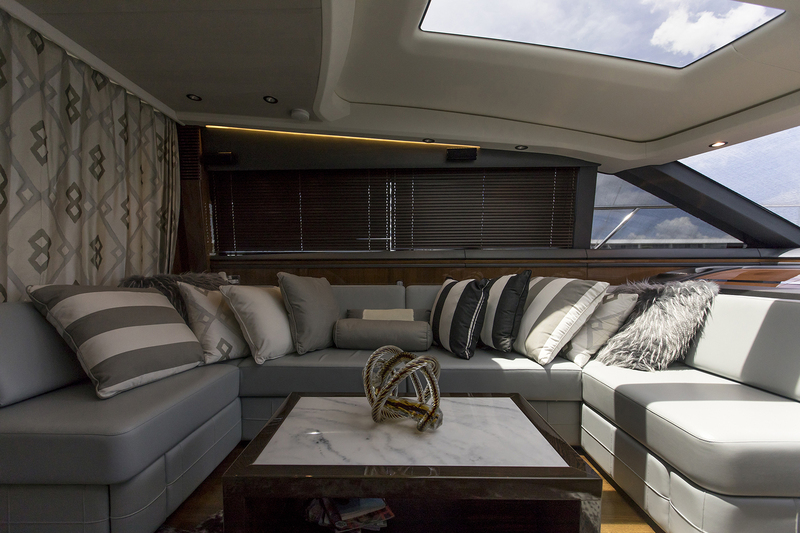 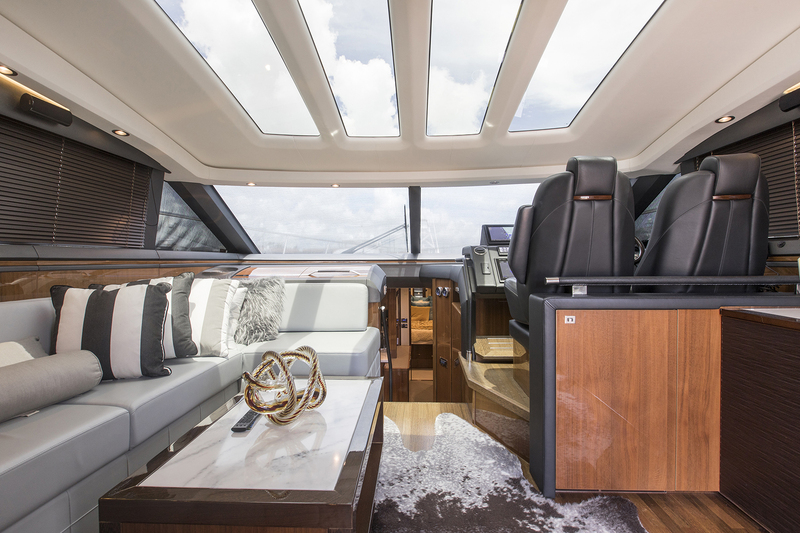 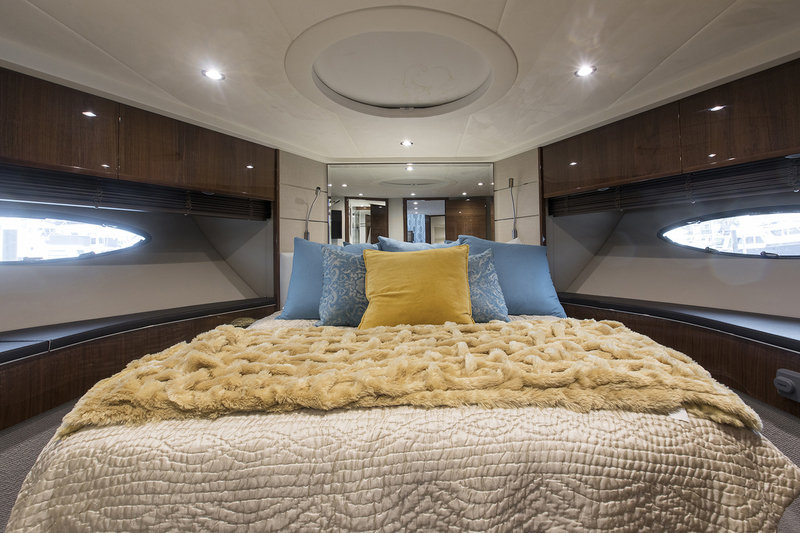 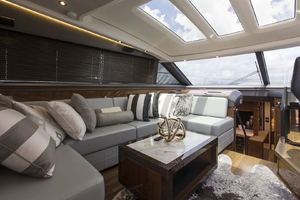 The foredeck area features additional sunbathing space on large sun pads with built-in back rest. 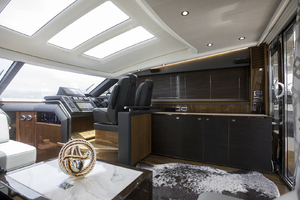 Forward of the cockpit is the entrance to the upper salon through the beautiful sliding glass/stainless steel retractable doors. 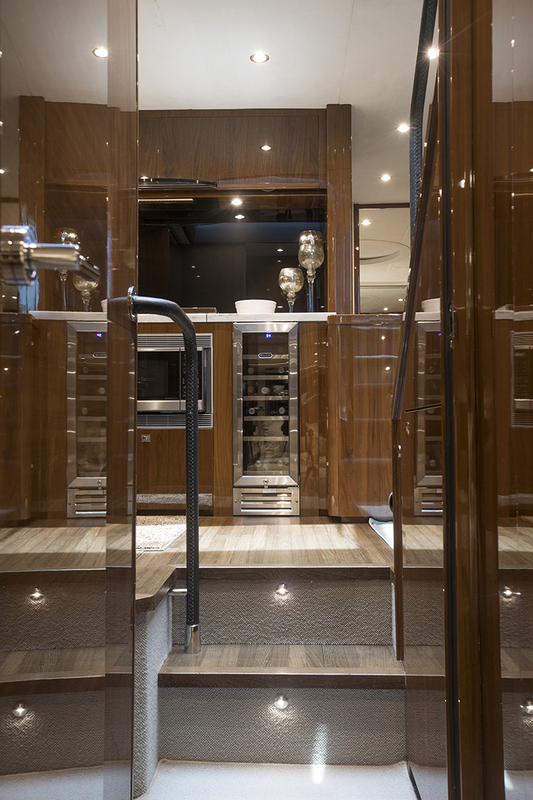 These doors slide to port to allow the interior upper salon and the exterior cockpit space to merge into one continuous area or be closed off from each other to suit the owner's desires. The salon has a large U-shaped settee to port with a rectangular shaped coffee table. 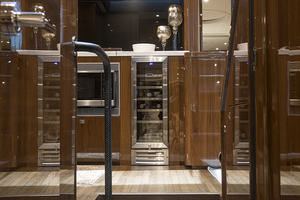 To STBD is a sideboard unit with a refrigerator and icemaker as well as a pop up TV, and storage. Forward to STBD in the upper salon is the upgraded helm area with black leather electrically actuated adjustable helm chairs. 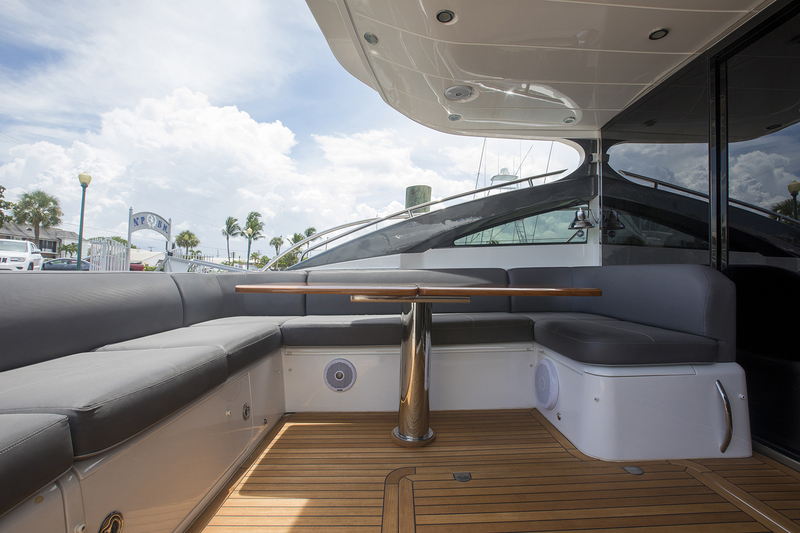 The helm provides an unparalleled view of the water underway. 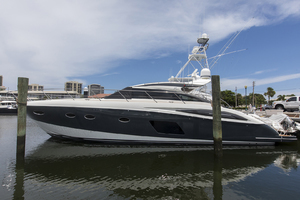 We have yet to find a V62S that offers the upgrades (both equipment and layout) that SWEPT AWAY offers. 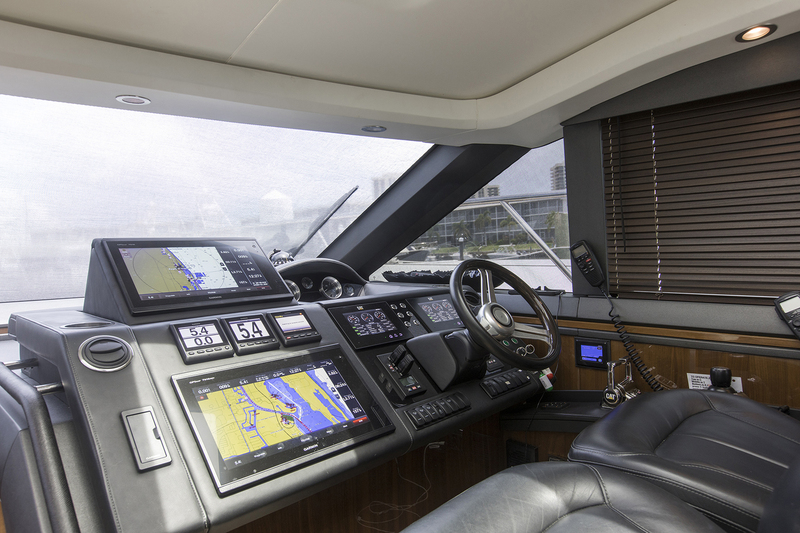 She is equipped with Garmin autopilot, (2) Garmin 7616's, (2) Garmin GHS10 VHF radios, Xenta joystick controller, (2) upgraded CAT 8" color engine displays, and other navigational aids. Centerline forward is the companionway stairs leading down to the galley and lower salon/dinette area. 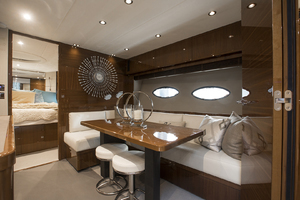 The lower salon/dinette to STBD is complete with L-shaped settee and a table with 2 stools. The fully equipped galley is to port. It features beautiful light stone counter tops with stainless steel sink, ample storage above and beneath the counter tops, garbage disposal, Whynter wine cooler, microwave oven, refrigerator/freezer, and cooktop. 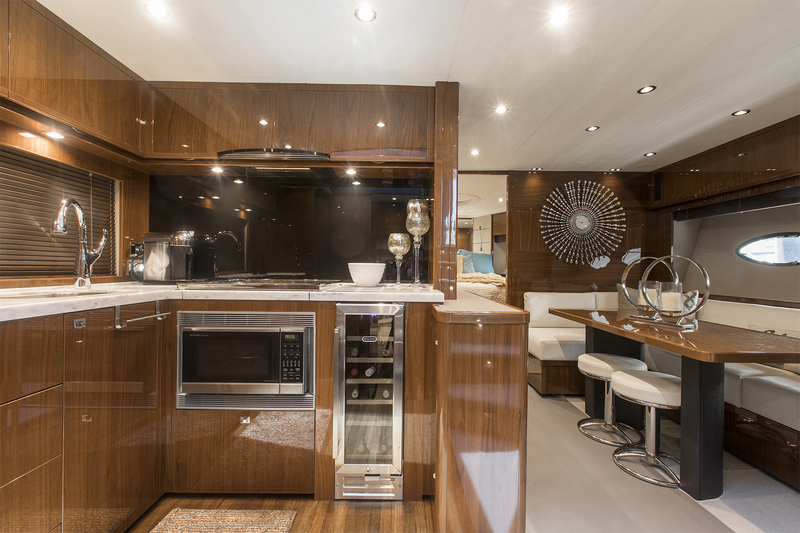 Forward of the galley, across from the dinette is the flat screen TV. 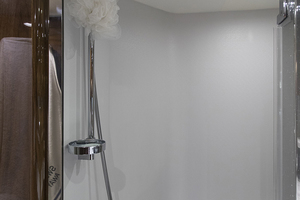 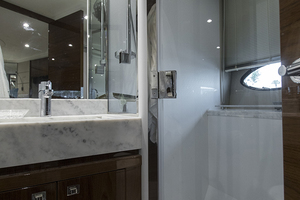 Just forward of the wall where the dinette TV is mounted is the day/guest head entrance with vanity sink and separate stall shower. 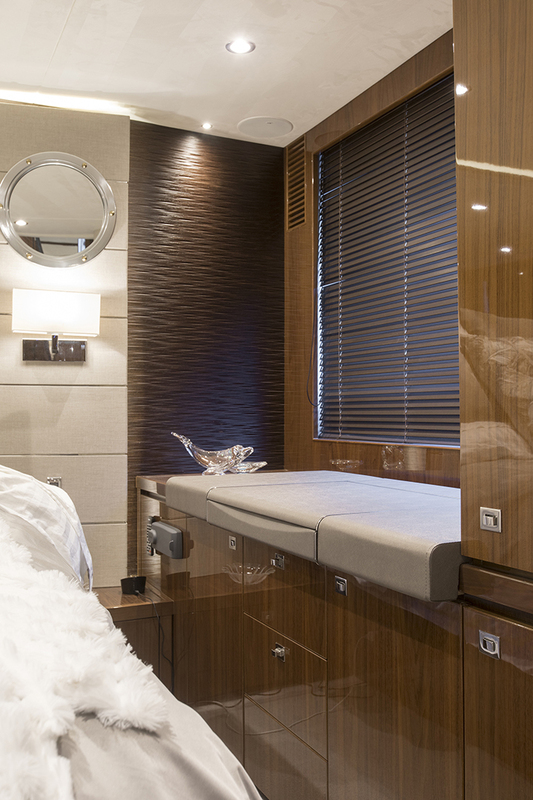 All the way forward of the lower salon is the VIP stateroom with a centerline double sized bed with mirrored head board, flat screen TV, and private access to the guest head. 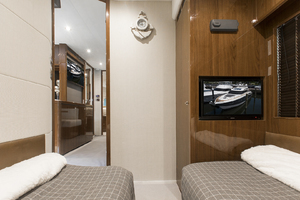 Aft of the lower salon/dinette to STBD is the guest stateroom with side by side twin berths and a flat screen TV. 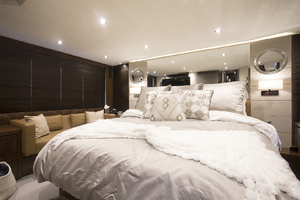 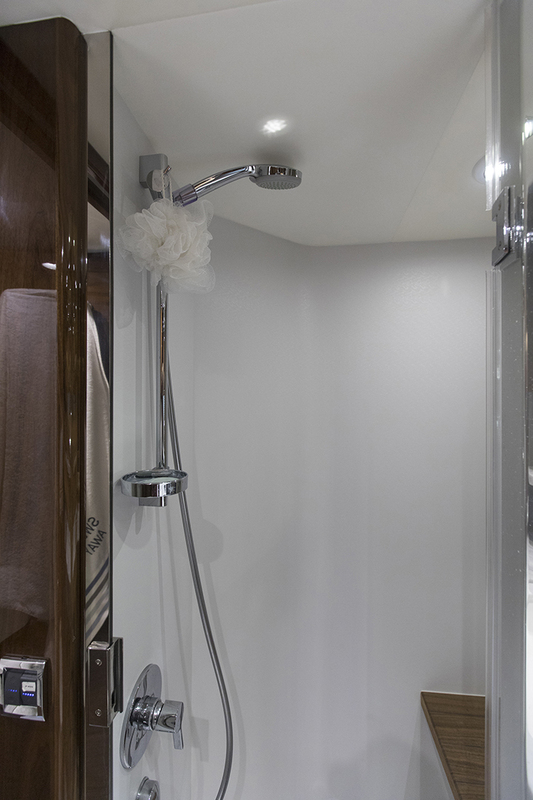 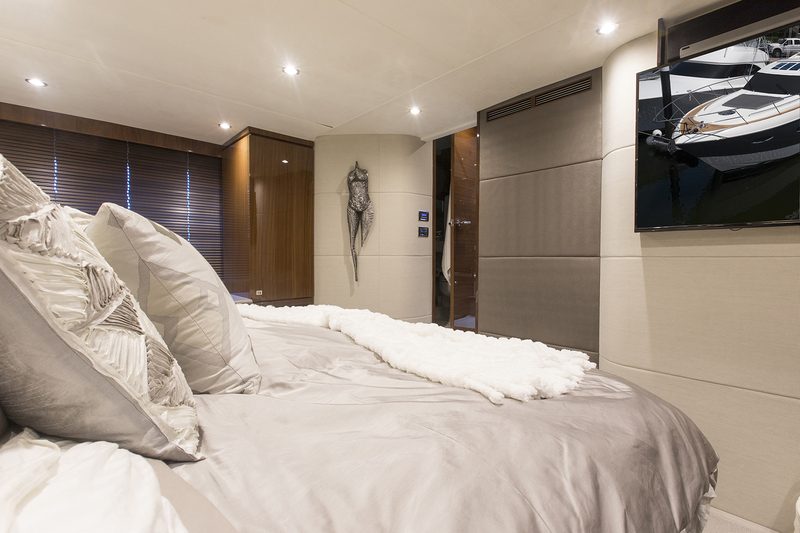 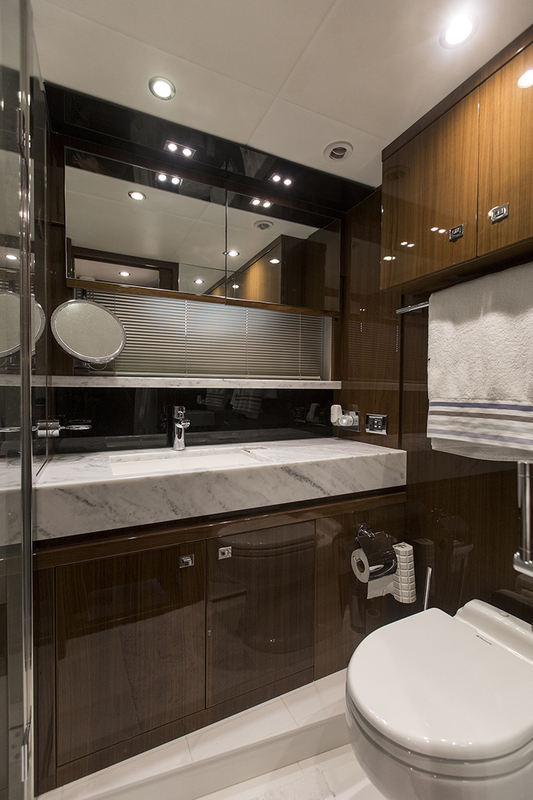 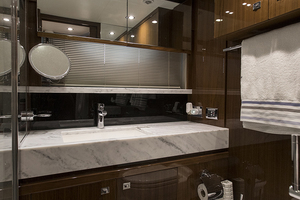 Access to the spectacular master stateroom is gained via a companionway located in the aft port corner of the galley. The luxurious master head is located outboard to port of the companionway between the galley/salon and the master stateroom. The master stateroom itself offers only the finest appointments such as a king bed with mirrored head board, makeup table, custom storage cabinets to port, an oversized flat screen TV with Sonos sound bar, and a sofa to STBD.